"His misguided actions and comments have failed to re-establish trust and confidence in Michigan State University," trustee Brian Mosallam said in a statement released Friday morning. EAST LANSING, Mich. — Two Michigan State University board trustees are calling for interim school president John Engler to resign immediately, joining a chorus of sexual assault survivors of disgraced former sports doctor Larry Nassar and top legislators who say the campus community cannot heal until Engler steps down. "His misguided actions and comments have failed to re-establish trust and confidence in Michigan State University," trustee Brian Mosallam said in a statement released Friday morning. His disapproval was echoed by trustee Dianne Byrum a few hours later. "The despicable and disparaging comments made about survivors by interim president John Engler are completely unacceptable," Byrum said. "I have concluded he is no longer the right person to lead Michigan State University during this difficult period." "I'm very grateful to see leadership coming from trustee Mosallam," said Rachael Denhollander, the Nassar victim mentioned in the Engler emails. "Leadership isn't going along to get along. Leadership is doing the hard and right things, no matter what.The rest of the trustees need to start actually leading, like they were elected to do." Denhollander, who has repeatedly criticized Michigan State's response to the Nassar scandal, earlier Friday called on trustees Byrum, Melanie Foster, chairman Brian Breslin and Mitch Lyons to join their colleague on Wednesday, saying they so far "haven't had the courage to do the same. "The Associated Press has left messages for comment with Michigan State spokeswoman Emily Guerrant and Foster, Breslin, Lyons and fellow trustees Joel Ferguson, George Perles and Dan Kelly. Pressure from outraged Michigan legislators is also mounting. Joining fellow Republicans in his caucus, Michigan Senate Majority Leader Arlan Meekhof "is very disappointed and does agree that Engler should resign," said his spokeswoman Amber McCann. The Chronicle of Higher Education and Detroit Free Press reported on the emails Wednesday. "The survivors now are being manipulated by trial lawyers who in the end will each get millions of dollars more than any of individual survivors with the exception of Denhollander who is likely to get kickback from Manley for her role in the trial lawyer manipulation," Engler said, misspelling attorney John Manly's name. "John Engler's most recent comments questioning the motives and intentions of our courageous survivors, and specifically, Rachael Denhollander, a survivor of Larry Nassar's horrific sexual abuse, who he accused of taking 'kickbacks' were disgraceful and unfit for a university president tasked with rebuilding trust and confidence in this institution," Mosallam said. Denhollander's lawyer, Manly, has been outspoken in his criticism of Engler, tweeting on Wednesday: "Engler spent his time as MSU President verbally urinating on child molest survivors of Nassar and scheming to hurt them. I can't think of anything lower or more cowardly. I wear his contempt & attacks as a badge of honor." Engler was hired by trustees after Lou Anna Simon suddenly resigned in January in the wake of a crisis that also led to the retirement of athletic director Mark Hollis. Nassar was fired from Michigan State in 2016, two years after he was the subject of a sexual assault investigation. His dismissal came less than a month after former gymnast Denhollander filed a criminal complaint saying Nassar had sexually assaulted her while treating her for back pain years earlier. At an emotionally charged board of trustees meeting in April, a sexual assault victim of Nassar, Kaylee Lorincz, alleged Engler pressured her to accept a payoff to settle her lawsuit without her attorney present. Engler later issued a statement, saying his memory and interpretation of the meeting was different and that he was sorry if anything said was misunderstood. "How pathetic is it that you were prepared to apologize to me, but instead, chose to call me a liar?" Lorincz tweeted on Thursday. "President Engler, you disgust me." Mosallam said Engler's apology didn't go far enough. "Our courageous survivors all came forward out of their own bravery and courage rather than a manipulative game," he said. "Such a suggestion otherwise is disgusting. ... 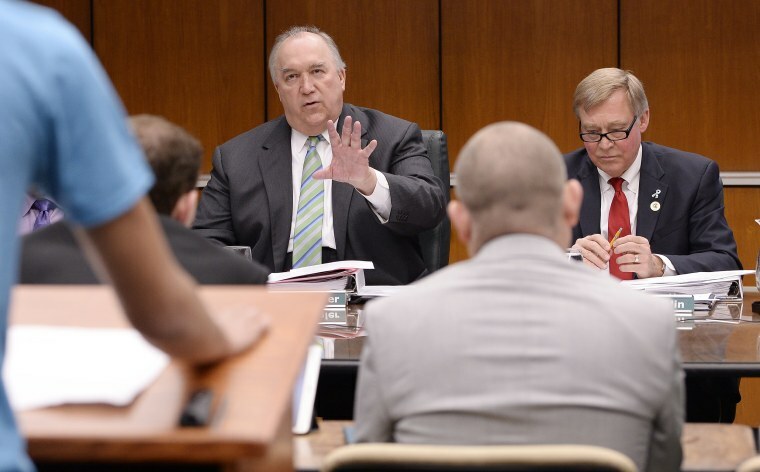 I no longer believe that John Engler's presence on this campus will allow Michigan State University to move forward." Engler on Friday insisted that he was looking ahead to a public Board of Trustees meeting, scheduled for next week.